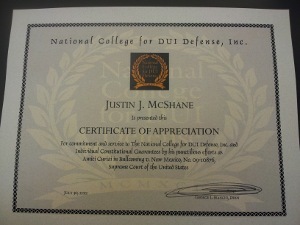 At The McShane Firm, we strive to be very best DUI lawyers in Pennsylvania. Part of that struggle for perfection is attending the most prestigious and cutting-edge training programs available. In the world of DUI, there is no organization more dedicated to DUI training than the National for DUI Defense, Inc. (NCDD) and the crown-jewel of the NCDD training calendar is the Summer Session held at Harvard Law School. As we have in previous years, all of the attorneys at The MCShane Firm attended the 2011 Summer Session held from July 28-30. The NCDD Summer Session is a three-day intensive seminar that brings together the very best and most experienced experts in DUI Defense. This year some of the esteemed faculty included Francisco Duarte, Virginia L. Landry, Andrew Mishlove, Ted Vosk, Evan M. Levow, Thomas Workman Jr., Roger Dodd, Bill Kirk, Mike Hawkins, Donald J. Ramsell, Doug Murphy, Kenneth W. Fornabai, Tommy Kirk, Leonard Stamm, Steve Rickard and even a keynote address by F. Lee Bailey. The highlight for me was being awarded a certificate of appreciation for my work on the case of Bullcoming vs. New Mexico which was a seminal case held this term before the Supreme Court of the United States. All of our team members took away a lot of knowledge from this training and are skilled and experienced enough to use the latest and best techniques in the defense of your DUI case. I can safely say that no DUI law firm in Pennsylvania has attended even close to the number of advanced training seminars we have. Whether you end up choosing The McShane Firm or not, I would advise you to check out the NCDD site and Avvo.com. Use these sites as a starting point for your search. Then ask your prospective attorney about how much DUI training they attend per year. At the end of the day, knowledge is the key to successfully defending a case. Please call the Pennsylvania DUI lawyers at The McShane Firm at 1-866-MCSHANE for a free consultation and experiences the difference.